In the Northwest, just below the territorial waters of Thailand, is the Langkawi Archipelago. It exists of 99 islands, of which only three are habituated. The inhabitants are real Malaysians. This in contrary of the peninsula. 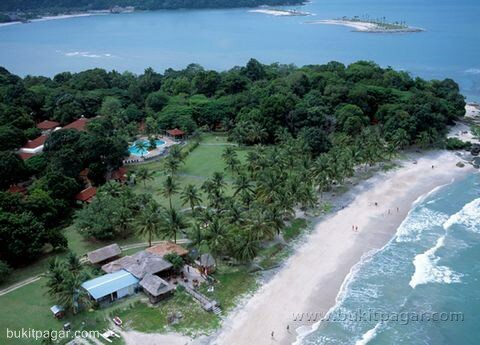 The Malaysian government has tried to give Pulau Langkawi (the main island) a touristy view. An airport has been made, there are regular ferry's to the mainland and in 1987 the island got a duty free status. Nevertheless the stream of coming tourists is disappointing. 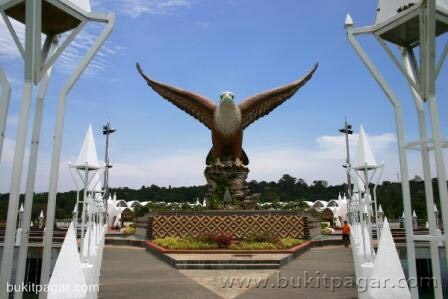 The great advantage of this all is, that Langkawi became a quiet destination for holidays. In promoting Langkawi as a green holiday destination, the government has prohibited visitors from bringing in their own cars and vehicles in an effort to control pollution and traffic congestion. As such, visitors must rely on taxis, rented cars and motorbikes, bicycles and public transportation. The ferry's de part from Kuala Perlis, George Town (Penang), Kuala Kedah and Saturn (Thailand). You can take from Penang a very fast boat (hydrofoil) to make a full day excursion to Langkawi. A lot of Malaysians and tourist do that, because they want to do tax free shopping. 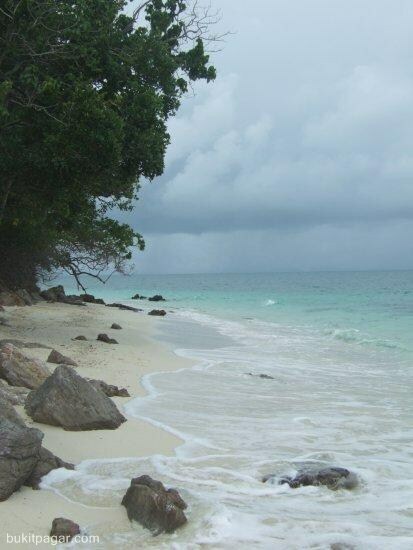 The islands are a truly paradise for those who want to spot butterfly's and birds. There are on the island specimens of butterfly's, that you can't find elsewhere in Malaysia. The island of Langkawi has quiet beaches and you can be transported to one of the deserted islands to have a sunbath. The main island has a lot of beautiful bays, where you can discover coral (don't take that with you!) and a lot of sea flora and fauna. Langkawi has a lot of beautiful and luxury resorts. After a busy life in your home country it's a relief to find such a rest on Langkawi. As visitors are not allowed to bring their cars into Langkawi, rented cars are the norm. If you prefer to do your own driving, then the alternative (motorbike taxi) would be for you to rent a car from the beach resorts; most of them have vehicles for rent or will gladly arrange to rent one for you from someone else. The normal rate is around RM80 per day. You can make several trips on the island and the shopping is tax-free. In Kuah are several shopping malls. Primarily the island is those who want to rest and love its simplicity and natural glory. The surroundings are beautiful. The dark green rock in front of the coast line are rising up till 60 meter ou of the blue sea and are covered with tropical forest. There's no nightlife on the island and those who want that, can better choose for Penang as a holiday destination. Langkawi is very loved by the Penangites, who love to come there for a rest. Although I got the idea, that it is also for shopping tax free. If you're going from Penang for a day excursion to Langkawi, the will ask you to bring a bottle of liquor home for them. "We stayed in the Pelangi Beach Resort. It's about a half hour drive by taxi from the town of Kuah. The resort has a large, beautiful, open lounge and reception. It was directly situated at a beautiful beach and you could walk very far into the sea. There was also a beautiful swimming pool, surrounded by two storied chalets, who were built in traditional style. These chalets are the hotel rooms. Little transportation cars, also used for golfing, will take your luggage to the right chalet..
At night there was not much to do in the hotel and outside the hotel. Opposite the hotel there was a sort of open museum, where you could see, how they cultivated rice. We went to the sea aquarium by bus, where we saw the fish which live in the Langkawi sea. We made an island tour and did some shopping tax free". Kuah is the capital city of the island. This is the first place upon arrival to the island by ferry. Since they gave Langkawi a duty free status, Kuah town changed a lot. It changed from a quiet, little town to a little city with beautiful shopping malls. Almost every shop is filled with tax free products, like cigarettes and cigars, clothes, electronically equipment and liquor. Before 1987 Kuah was the only place, where you could stay for the night.